Brian and I have really had to push ourselves to get back into passage mode. We’d done so much day sailing through the Bahamas that just making 40 miles seemed strenuous. We’d traveled from Dollars Harbor, Long Island to Great Inagua over a two night cruise which helped to get us back into the swing of long distance travel. 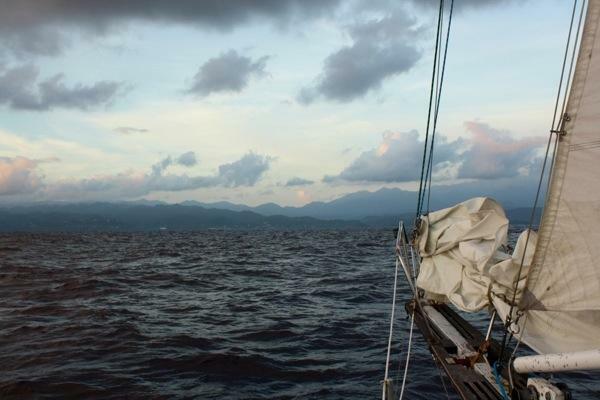 We were just settling into Great Inagua when a check of the weather gave us a narrow opportunity to sail through the Windward Passage; two days of 15-20 knot winds with 4-6 foot seas. After this, the window closed and we’d be waiting in an uncomfortable anchorage for an undetermined length of time. Tallyho! Rode Trip and Serendipity got underway, starting our passage in the evening, Jamaica bound! It was great to once again have company for our overnight sail. Rode Trip and Serendipity did VHF check-ins throughout the night. Matt updated Brian several times with ships spotted on his AIS. He also let us know that Rode Trip is invisible on radar; although we do like our invisibility cloak, we’re thinking about adding ‘heighten the radar reflector’ to our to-do list. I’m sure this will maybe get done sometime in the future. Throughout our trip the Cape Horn windvane was on the fritz. It’s been jamming and causing us to accidentally jibe. Once set, it would hold for an hour or two but a big wave would knock it off track and it wouldn’t adjust. Then we’d hear the jib start to flap and if we didn’t get into the cockpit in time…WHAM! The boom would slam across the cockpit and jibe. UGH! So our newly acquired 6-hour shifts (which had been working beautifully) were lessened to 3 or 4 hours because there was quite a bit of hand steering involved. This will need to be repaired ASAP once we’re settled in Jamaica; the windvane is a luxury we’re not willing to go without! We had some fun on this passage and encountered some interesting sights too. We were able to cook, clean, read, navigate, and sleep rather comfortably. Our first event occurred when I lost my coconut palm hat overboard. I let out a sigh, “aaaawwwwww…” that Brian heard even though he was supposedly sleeping and came on deck to the rescue! Three man-overboard drills later I’d finally snagged my hat on the boathook and just as I was turning to walk down to the cockpit with it I glanced at the deck and, “eeeewwww…” nearly stepped on a flying fish! He’d landed on deck the previous night and had been drying out in the hot sun all day. 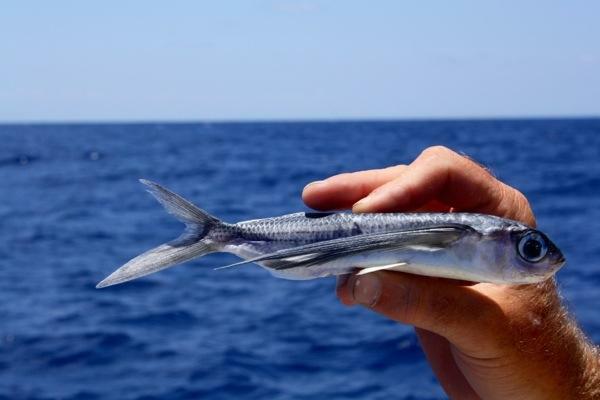 Flying fish are really amazing. They dart across waves and really, truly look as though they are flying. They are beautiful to watch. They tend to get on boat decks in the dark and this was the first one we’d gotten. Brian didn’t hesitate to fasten this little, sun roasted fish onto a trolling hook. 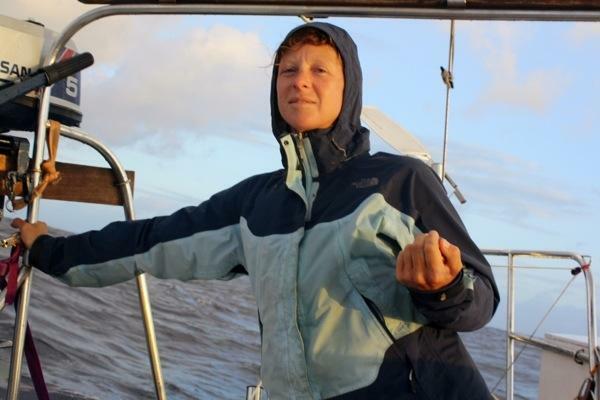 During the days on our passage the winds died down to about 10 knots, the seas stayed high and it was a bit uncomfortable. Quite a difference from the nights when the wind built back to about 20 knots. 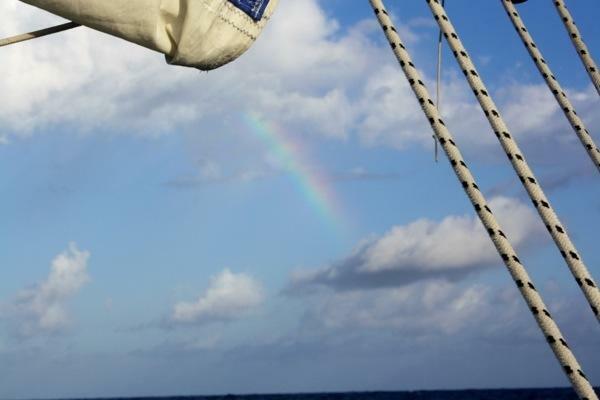 In the day, we were putting up all our sails and come sunset we were reefing the main and choosing either jib or staysail. The day our flying fish arrived it was hot and calm, Rode Trip was barely moving. We had our first opportunity to fly a spinnaker. Hooray!! Brian had installed the spinnaker back in Georgetown with the help of Mark (sv/Por Dos). Mark had delivered the spinnaker to us from his friend, John, and all the guys were anxious to give it a try. 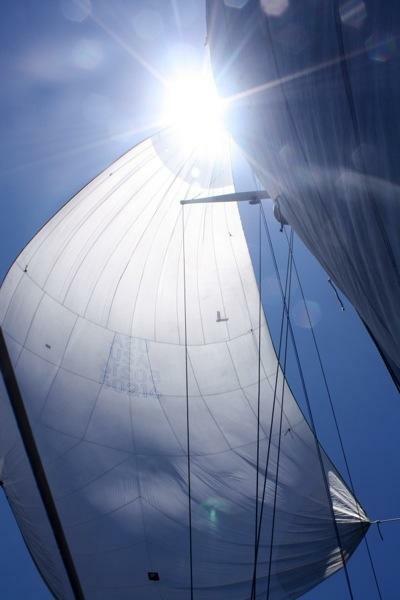 Until this passage, though, all our downwind days were high winds. We got everything rigged and floated the spinnaker. Wheee! Rode Trip sailed back up to 4.5 knots and the spinnaker looked brilliant! We want to thank Mark and John for this glorious opportunity! Unfortunately it was a one time only experience. 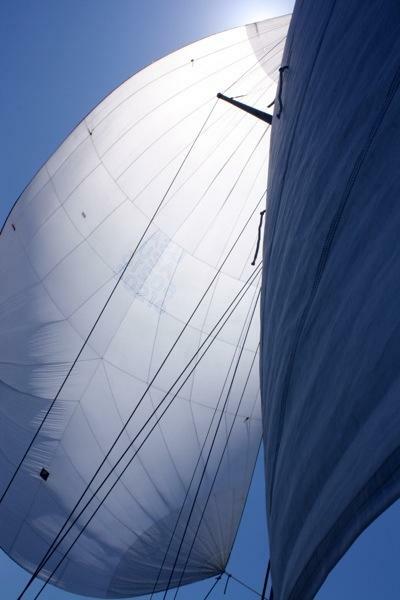 The spinnaker had wrapped around the forestay a few times and we’d been able to easily unwind it…until that one time that it wrapped and…RIPPED! Sad day! The spinnaker tore right down the middle and we then spend the next hour unwrapping it from the stay and getting it put away. It was a good run, spinnaker! The next morning at dawn we had a great finale event. I love the morning shift; it’s peaceful and the colors in the sky are magnificent. This dawn the moon was still visible to our starboard while the sun was rising on our port amidst huge cloud formations. I kept my eye on a raincloud that was headed in our direction. The raincloud passed overhead and the flood gates opened. We had a brief rain shower, but it was warm so no biggie. As I’m watching the clouds continue onward, another stormy-looking formation was moving in from the south. High above in the clouds there was a tubular, grey shape…hmmm…was this a jet stream? I hadn’t heard or seen any other indication of a jet overhead. I’m still watching and the shape is extending its-self like a snake down from the clouds. WOAH! “Brian, you’ve got to see this show!” It was worth waking for this display. 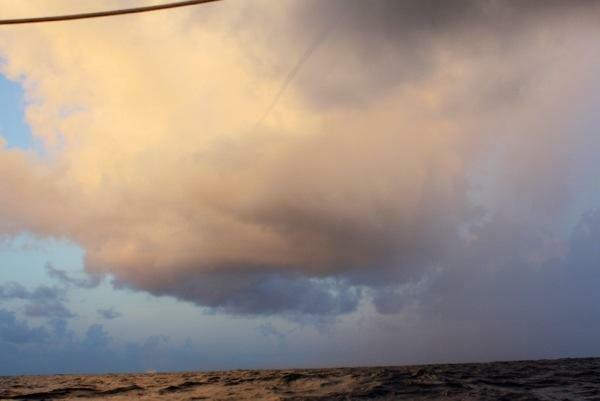 Brian took one look up and replied, “turn to port.” This was a real, live waterspout. You could see far ahead where it touched down on the water and the water was twisting upward. Cool! It seemed to dissipate, and then another formed. You have to look pretty closely, but in the top/center of this photo you can see the tubular, grey shape coming down through the clouds and then down on the water you can see some spraying water just to the left. We’d made it through safely and Brian went back to sleep while I then admired the rainbow.